I was wandering around our local farmer’s market last week when I walked past a little stand called DebHouse. I was intrigued by her perfectly folded little bags full of baked goods, but unfortunately I was short on time, so I didn’t stop. Once I got home for the evening, I did a quick search for DebHouse and discovered that Deb is a local gal, retired from her global marketing career and is now a home baker. She sells her lovely baked goods online, at the Perrysburg Farmer’s Market and a local grocery store. A portion of Deb’s proceeds go directly to the Deborah House, a home where the shattered lives of young Romanian girls are being rebuilt through education, counseling, legal services and job training. Personally, I think it’s amazing that Deb’s passion for baking is making a direct impact on the lives of young women in need! People like Deb warm my heart and are truly an inspiration. Deb has a delectable list of cookies available on her website, but her Buckeye Bars are what caught my eye. Being from Ohio, I have sampled many pieces of Buckeye Candy, but never thought of turning that peanut buttery goodness into a bar. 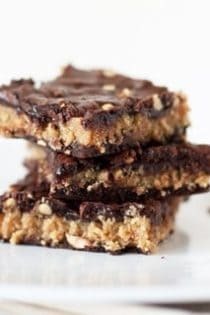 I immediately did some internet searching and found an easy recipe for a layered Buckeye Bar that will definitely satisfy your sweet tooth. This recipe does utilize a boxed brownie mix, although I typically bake from scratch, I decided to try the recipe as written. If brownie mix is not your thing, simply sub in your favorite brownie recipe. 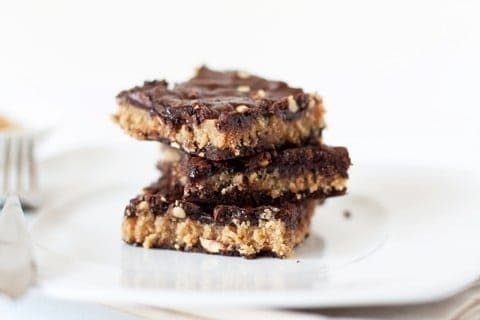 These Buckeye Bars are simple, decadent and delicious…I am betting they’re even better with a homemade brownie base. We thoroughly enjoyed these at room temperature, but I adored them cold out the fridge! Now I must head back to the farmer’s market, meet Deb and try her version. Have a fabulous day and thanks so much for stopping by My Baking Addiction. 1. Preheat oven to 350 degrees. Lightly grease a 13×9x2-inch baking pan and set aside. 2. In a large bowl, combine brownie mix, eggs, oil and vanilla. Beat until combined. Stir in peanuts. Remove half of the brownie mix and set aside. 3. Spread remaining brownie mix into prepared pan. 4. Whisk together sweetened condensed milk and peanut butter in a medium bowl until smooth. spread peanut butter mixture evenly over the brownie mixture in the pan. Separate the reserved brownie mixture into pieces. Flatten each piece with your fingers and place on top of peanut butter mixture. 5. Bake in preheated oven for 25 to 30 minutes or until top is set and edges are lightly browned. Cool completely in pan on a wire rack. Cut into bars, makes 32 pieces. I am a fellow buckeye (and mac lover FYI) YUMMY recipe, I must try! Beautiful photos too! I admire people like Deb. They make a difference in our world. I hope you get to meet her soon. Wow, these look awesome! Peanut butter and chocolate are quite possibly the best combination ever. My mom made the best buckeyes when I was little. These just sound delish. I’m ok with boxed brownies, and these look soo amazingly tasty. Have you made actual buckeyes before? If not, you should! I usually am a fan of baking from scratch too, but sometimes it’s nice to use little shortcuts! YUM! I love buckeyes, this sounds fabulous! Yum, yum, yum!! I am from Ohio also, so anything Buckeye catches my attention!! I will be trying these for sure. i CANNOT make these, for it will SURELY result in me eating the ENTIRE pan. i’m such a sucker for buckeyes. I’ve got no problems with taking a short cut and using a mix, especially brownie mixes which are pretty darn good! Thanks for passing along the recipe and sharing the info on DebHouse. As a scatch cook, I’m confused. Break apart the brownie batter in your hands? How is that possible? And, do you start with a brownie recipe that makes a 9 by 13 pan or a small, square one? In theory, I am all over these. The 19.5 ounce mix I had called for a 9×13 inch pan. I just kind of scooped spoonfulls of the batter on top and spread it around the best I could spreading and flattening it with an off-set spatula. Hope this helps. Oh. My. That picture at the top of the post made me sit down. Except I was already sitting down. Stopped in tracks. Must make. Yum. Thank you. Thank you in every language. This looks just divine. Seriously. Much easier than buckeye’s, with all the same great taste… making soon! Gah!! I’m trying to eat less of this stuff! Man, these look right up my alley. I’m a peanut butter addict, with chocolate coming in a close second. 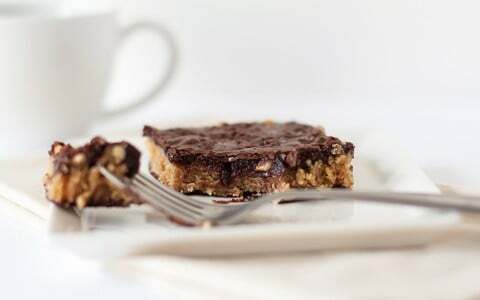 These bars look amazing, and pretty easy- yum! Looks like a great treat! Much more interesting than an average brownie. Thanks for sharing! You have all of my favorites in these sweet, yummy bars. So tempting right now, I would probably eat the whole pan. I wish Perrysburg were closer to Columbus! They’re pretty good too. Thanks for sharing!! These sound and look super delish. Anything with peanut butter is good in my book. Oh, man, those look amazing! Chocolate and peanut butter are my soul mates. True story. I’ve never tried buckeyes but always wanted to and now seeing them in bar form, I think I’ll have to try both!! These look irresistible. I’m a Buckeye too and love seeing recipes like this. I’m currently perfecting my buckeye cakeball recipe. But I’m printing this one too and will be making it this month I’m sure. These look delicious, I plan on trying this recipe out to bring to my home group Bible study. I’m baking these right now and I can’t wait! They smell so good! Thanks!